Lee Palmer Wandel. 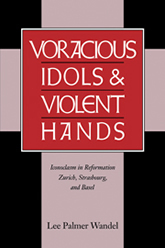 Voracious Idols and Violent Hands: Iconoclasm in Reformation Zurich, Strasbourg, and Basel. Cambridge University Press, 1995. This is an effort to recover the participation of ordinary Christians in the enterprise of Reformation through an exploration of the meaning of acts of iconoclasm: what they tell us about the role of images in Christianity and about ordinary people’s theologies. Its focus, on ordinary Christians, distinguishes it from other studies of Reformation iconoclasm. Its concern, to recover their agency in Reformation and to discern their theology in acts, may be of interest to scholars in American history, anthropology, and religious studies.